As you can probably tell, I have a weak spot for designer handbags - and a never-ending wish list, to boot! 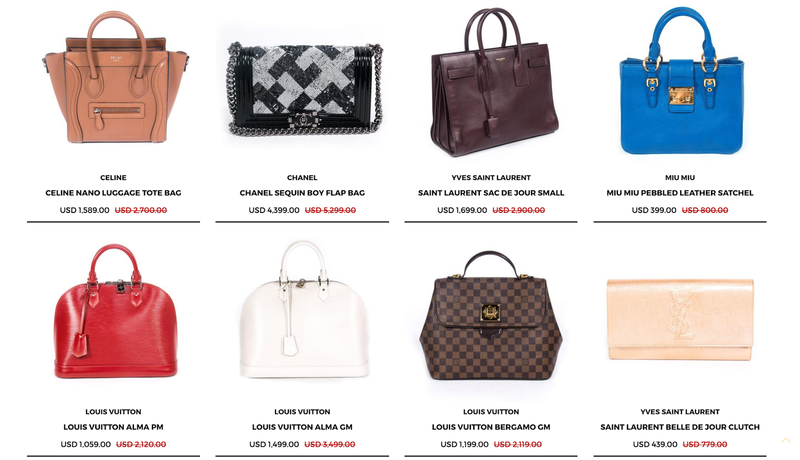 Prices are constantly climbing in today's luxury market, so sometimes, the best bet is purchasing a handbag secondhand. Shopping for luxury items online can be tricky, as you have to make sure the site you are purchasing from is reputable and trustworthy. There are a few online shops I wholeheartedly trust for authentic merchandise in like-new condition, one of which is a consignment store by the name of Re-Vogue. Based in Dubai, Re-Vogue showcases a very chic set of bags, clothes, and shoes, ranging from classic favorites like Chanel and Louis Vuitton to trending designers like Balmain and Isabel Marant. My favorite thing about the site is that the items are in near perfect condition, worn only once or twice by the fabulous ladies of Dubai, and are still incredibly reasonably priced. The other fantastic thing about Re-Vogue is that they also have an eBay store, adding extra security to your purchase. I am an avid user of eBay and Paypal, so to me, this is always a benefit. 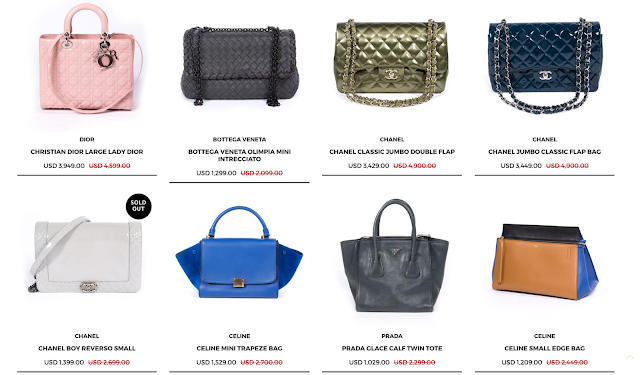 I highly suggest you go explore the site for yourself - there are so many more bags on my wish list now! The Chanel bag selection is beautiful, and the bags are all in such pristine condition. 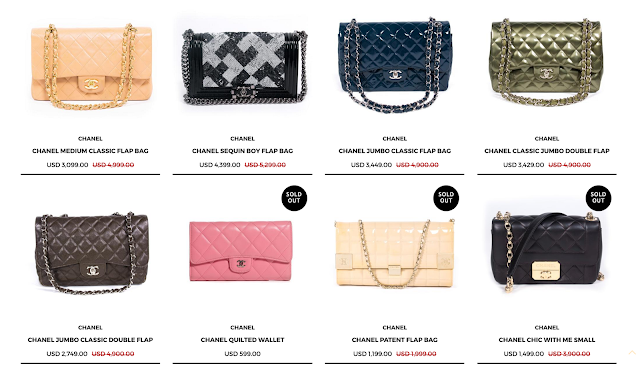 I prefer vintage Chanel to new Chanel, actually, and finding such gorgeously preserved bags is a rarity. Really taking it up a notch, the site also carries a whole slew of cool clothes, including the incredibly coveted and fashionable Balmain jackets. I'll take the green one! Without further ado, here was my selection from the site - a beautiful suede Balenciaga Papier A4 mini in the vert olive color. This bag is absolutely perfect in its color and size, and was very well priced. It will make the perfect addition to my fall wardrobe of gray, burgundy, and olive, and is already fitting well with my cream-colored choices for summer! I feel so lucky to have found this beautiful bag. This bag has been on my wish list for ages, particularly in a suede, and this color was just perfect for me. Shopping with Re-Vogue was an absolute delight, considering the bag is in spectacular condition and had a fantastic price. I will definitely be choosing the site in the future for my luxury shopping needs! Online shopping in dubai for consumer electronics, jewellery, home appliances, watches, sunglasses, baby products & other deals at Bazzar.ae. ✓ Free shipping* ✓ Cash on Delivery ✓ 3 Days Return. Shop Online on Bazzar.ae and get the best price in UAE. Awesome handbags collection! I like those great products.Thanks for sharing. Wow!1 Amazing bags and shoes collection. I have checked out all of They are damn delightful and good looking. The design of the bags and shoes are unique and attractive to the user. Get comfortable, and get ready to fall in love!